This campaign ended on November 27, 2018, but you can still make a gift to University of North Carolina at Asheville by clicking here! An Anonymous Donor gave $15,000 because $60,000 was donated in 4 days. All donors who make a gift of $100 or more will be listed on our #GivingTuesday Honor Roll on the UNC Asheville website and social media. 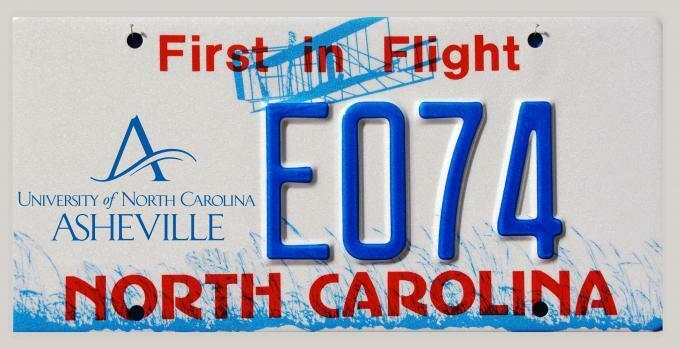 The first 50 donors to make a gift of $25 or more will receive a UNC Asheville license plate. Demonstrate your Bulldog Pride every time you hit the road! All donors who make a gift on November 27 will be listed on our #GivingTuesday Donor Recognition list. One day. One goal. The entire UNC Asheville community coming together to raise $75,000 for our deserving students. #GivingTuesday is an international day of giving back. We invite all UNC Asheville alumni, parents, faculty, staff and friends to be a part of the movement and make a difference for our university by making a gift on November 27. Last year, our university community contributed $62,432 on #GivingTuesday, the most in UNC Asheville history. If we raise $60,000 this year, it will unlock a $15,000 challenge gift, bringing our total to $75,000 raised in 24 hours – another record-setting day of generosity. Give back to the area of campus that matters to you. Whether that’s scholarships, athletics, an academic department, or a very specific cause of your choosing, you'll help demonstrate the Bulldog community's dedication to providing the best possible education to UNC Asheville students. That dedication keeps our university ranked among the top public liberal arts colleges in the country, year after year. Make your gift. Challenge your friends. Talk about it on social media. Send text messages and make phone calls. Encourage everyone you know to support UNC Asheville on #GivingTuesday. This #GivingTuesday, be one of the first donors to make a gift of $25 or more, and you’ll have the opportunity to be one of the first Bulldogs to get a specialized license plate. Demonstrate your UNC Asheville pride every time you hit the road! Learn more about the UNC Asheville license plate initiative here.